What should an expeditionary force look like, how should it be organized, what capabilities should it have, and how should it be deployed and sustained? How can the United States Army operate at a smaller scale and tailor force packages for specific needs? What does an expeditionary, regionally aligned force — one that meets a number of United States Army desiderata regarding tailorability, scalability at a level lower than a brigade, and light deployment and sustainment requirements — look like? What compromises and risks are entailed in designing a force to be more expeditionary? French Army operations in Mali (Operation Serval) in 2013 provide a model for designing and operating an expeditionary force, one that has a number of attributes and competencies that United States Army Chief of Staff General Raymond Odierno has indicated to be requirements for the Army. The model therefore provides a living example that illustrates what meeting those requirements entails, as well as the associated risks. 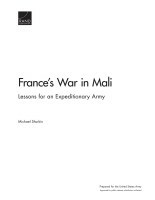 As France's War in Mali: Lessons for an Expeditionary Army details, the French in Serval demonstrated that they are adept at quickly fielding small yet highly capable forces tailored for specific needs and objectives and reiteratively task organizing as the situation evolves. They have done so in part by pushing modularity below the battalion level, enabling them to disaggregate and reaggregate elements of their brigades. The French have also invested in technologies and vehicles designed to enhance the capabilities of its units at all echelons. Moreover, the French Army, particularly its expeditionary brigades, is for all intents and purposes a regionally aligned force that has a demonstrated ability to leverage its area-specific expertise to compensate for its small size and to work effectively with and among local populations. The French Army also appears to have an operational culture well suited for expeditionary warfare, particularly in austere environments and with limited resources. The aspects of French Army operations in Mali discussed in this report make the French Army a model for building the kind of expeditionary force envisioned by Odierno, and perhaps one that is also increasingly in line with future United States Army budgets. The French example also highlights compromises that are associated with becoming more expeditionary and the attendant risks. Operation Serval Provides an Example of How a Technologically Sophisticated Army Organizes and Fields an Expeditionary Force. The French Army exhibits many of the traits outlined by General Raymond Odierno in his vision of the future force. The French Army in Mali operated using small, scalable, and task-organized combined arms forces and built them up or folded them into larger, scalable formations. French Requirements and Resource Limitations Have Led the Army to Adopt a Force Structure Well Suited for Operations Such as Serval. The French use relatively lightly armored wheeled vehicles, which have smaller sustainment requirements compared with heavier, tracked vehicles. The French prefer mobility over protection, a choice that reflects their cultural and doctrinal emphasis on maneuver. The French Army draws on an expeditionary culture, which reportedly makes coping with austerity a point of pride and also reinforces certain approaches toward operating among local populations. The French Way of War Represented by Serval Might Not Be Optimal for U.S. Commanders, Who Have Greater Resources at Their Disposal. Those resources enable Americans to minimize risk in a manner that the French cannot. Serval does not shed light on France's capacity to handle more-intense conventional conflicts or provide conventional deterrent power. The French are confident that their success on the battlefield and low casualty rate demonstrate the proficiency of their military, but they took large risks. the costs of France's rotational equipping strategy (PEGP) and its effect on readiness. This research was sponsored by DCS G-8, QDR Office, and conducted within the RAND Arroyo Center's Force Development and Technology program. RAND Arroyo Center, part of the RAND Corporation, is a federally funded research and development center sponsored by the United States Army. Shurkin, Michael, France's War in Mali: Lessons for an Expeditionary Army. Santa Monica, CA: RAND Corporation, 2014. https://www.rand.org/pubs/research_reports/RR770.html.